Acid halides are ordinarily derived from acids or their salts by replacement of hydroxyl groups by halogen atoms. The carboxylic acid halides are also called halides. The acid halides are highly reactive substances used primarily in organic syntheses to introduce the acyl group. They react with water, ammonia, and alcohols to give carboxylic acids, amides, and esters, respectively. 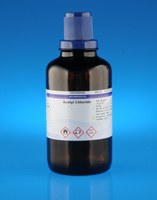 Most of the Acid halides supplies by Loba Chemie are liquids, insoluble in water. They have sharp odours and irritate the mucous membranes.